The next corridor leads to a large two-leveled room. Two more Silver Hands patrol here, one on the top level to the left, and the other straight ahead on the lower level. 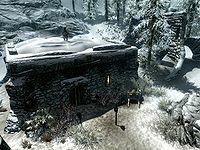 On the upper level there are several sets of shelves mostly holding ruined and burned books, however among these are several common books, a random potion of stamina and An Explorer's Guide to Skyrim, which may add map markers for some undiscovered locations. There is also a copy of Charwich-Koniinge, v2 in an open topped crate on the floor and to the left of the shelves are a pair of iron boots. On the lower level, there is a table holding a random potion of stamina and a copy of Forge, Hammer and Anvil, a bench in the opposite corner has a bottle of wine on top. To the west, in a darkened room is an adept-locked chest. There are stairs leading down to the north. Halfway along the next corridor, there is an adept-locked door on the left. Behind the door is a makeshift bedroom, with a Silver Hand sleeping in the leftmost bed. There are three other beds haphazardly strewn around the room, two end tables and an unlocked chest. On the shelves beside the bed with the bandit there is a random potion of healing and a cow hide. On a table in the corner there are three steel ingots, a pheasant roast, three garlic bulbs, a random potion of stamina, and a deer pelt. Hanging from a cave-in blocked doorway in the north wall are two garlic braids. The corridor leads to the forts dining and kitchen areas. There are two more Silver Hands here, one across the room by some raised metal spikes, and one to the left sitting at a table, which also holds a random potion of magicka. The table south of this holds an iron ingot, and a random potion of regeneration and a bottle of wine. The table in the southeast of the room has a medium coin purse on top and an unlocked chest beside it. The lever to lower the spikes is to the right of them beside the chest. To the south is the kitchen which holds a selection of food items on shelves and in barrels, including three rabbits and a pheasant hanging from racks, with a second pheasant on the floor beneath. Past the metal spikes in the dining room is the door to the cellar. From the entrance, if you head forward, turn left, then left again, you will find some wheat on an end table, and a chest in the dark corner. The other direction leads to a wine cellar. A Silver Hand patrols the next section, past a spike wall. A pressure plate is located in the middle of the corridor leading through to the Silver Hand, and on the other side of the trap is a pullbar for manual activation. The reason for this is a bed and chest in a hidden section behind the default position of the spike wall, just pull the handle and the wall will swing open and remain so. You will now have access to the chest. Past the trap is a small storage area, full of several piece of iron and leather armor, iron weapons as well as a minor potion of stamina and magicka. 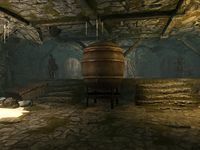 Down the stairs, there is a random sword and helmet on a table, and a door, which leads to what appear to be a room for brewing mead. There is a Silver Hand either side of the main boiler in the center of the room. 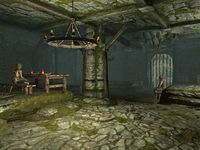 Behind the boiler, on the raised section of the room, there is a shelf with minor potions of magicka and health, and a copy of the Light Armor skill book The Rear Guard and another set of shelves holding alto wine and wine against the south wall. There is a tunnel carved into the ice and rock to the north. There are two more Silver Hands in the first room along the ice tunnel, along with two cages, one of which holds a werewolf. Both cages have apprentice-level locks, and while the cage with the werewolf holds a three legs of goat, the other cage holds only a dead horse. You can attack and kill the werewolf in the cage before unlocking the cage, but it will be considered an assault. It will not be considered an assault if you unlock the cage and let the werewolf turn hostile. The next room is guarded by a Silver Hand, and is a torture room. There is more wine on shelves to your left as you enter and a dead werewolf laying in front of a rack. A second table covered in bloody bones with an iron dagger found among them. After the corridor there is an open doorway into a large room, with stairs down into it on your right. Below you are two Silver Hands by a large fireplace opposite. Behind the fireplace are shelves holding two random skill potions and an apothecary's satchel with some rarer ingredients. The room has seen better days with fallen masonry and crushed wooden furniture littering various corners of the room. To the south, below where you entered is a lighted corridor leading to a door back to the refuge. You enter into a small room with a lit brazier in front of you and a random potion of healing, both on a low table. On your left as you enter, on the south side, are stairs that lead you to the final room. Behind the barred door there is a room with three Silver Hands. They usually gather by the table on the platform to the east with an iron helmet, a piece of mudcrab chitin and the fragments of Wuuthrad (If you are here during the related quest) and a copy of the One-handed skill book 2920, Morning Star, v1. On the table by the fireplace to the south is a copy of the Block skill book Warrior along with two common books and behind this a cupboard. The opposite platform is devoid of loose items, but does hold the boss chest, where any items you are sent here to recover may be found. There is also a grindstone, an anvil, and a workbench on this platform.